I thought it was the perfect bonding moment– Nolan and I at the OC fair; his first time – and we “won” a goldfish. Obviously, I expected this since it’s basically happened from the beginning of time. Every single fair insists on blessing each visitor with a fish. You go home and you realize now you need a tank, food, and whatever other fishy supplies necessary. Or, somehow the fish manages to disappear and you simply explain that he prefers toilet water to tank water. The true testament to my fondness for Chewbie happened many months later. He was now quite big and definitely starting to fill out his little tank. I thought all was well and we went to my parents’ house for a couple weekends in a row, dropping feeding tablets in the tank to last him while we were gone. Little did I know I needed to pay attention to the Ph level (I’ve never cared for a fish before) and I came home to find Chewbie looking fine except for a red spot on the top of his head. Hmmm. So I immediately turned to Google and learned he had a bacterial infection. Chewbie was going to die. I called my husband distraught, and to my shock, almost in tears! He was Nolan’s little buddy and we’d watch him grow; I no longer wanted to flush him. Somehow, our scaly fighter survived once again and life continued without any incidences. He was with us for over a year when we decided it was time for an even bigger tank. So off to the fish store my husband and son went. 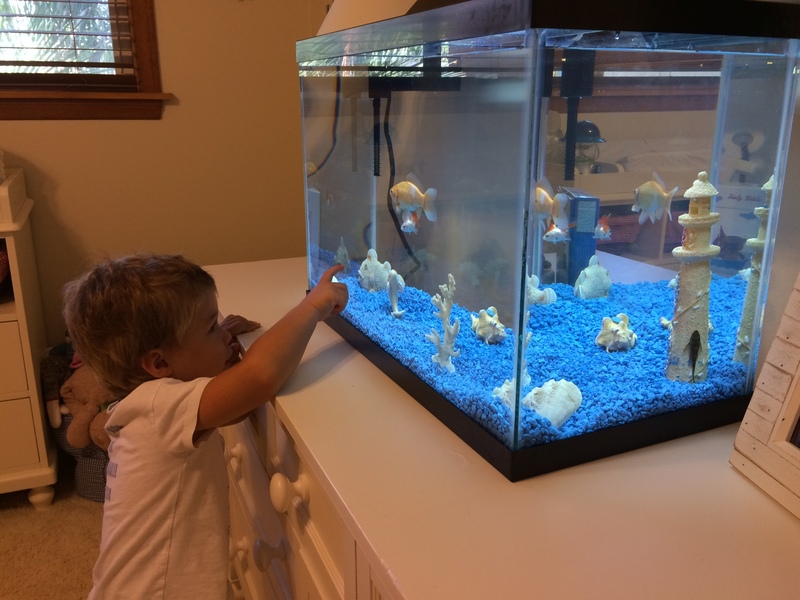 They came home with a HUGE tank- waaaaay too big for my son’s dresser (where would we put it… in the middle of the living room? )- and a “brother” and “cousin” for Chewbie… Oh my gosh. Both boys smiled at my shock and proceeded to justify the size, the second goldfish, and the suckerfish. I was totally against all three changes. It’s silly, but I didn’t want anyone taking away Chewbie’s attention. (That looks ridiculous on paper.) And I said to my husband- it looks like there’s more than one sucker in this situation. Long story short though, we soon discovered Chewbie had Ich and we rushed to the fish store to get whatever was necessary and start treatment. I felt an incredible sadness and a pit in my stomach as I read the mortality rate is often 100%. We’d just given him a new playground and new family. A number of changes that could’ve caused the infection. He started to eat less and less and I was crushed watching his usual vitality and comical routines disappear. He no longer darted to the upper right part of the tank when I fed him and it all seemed so… sad. We came home from Nolan’s first day of preschool and I saw him, in limbo at the bottom, for sure not his normally active self. And then I saw his eyes – a milky white film covered them and I knew… this was going to be the end of a very important chapter. The Ich, which looked so improved this morning, was now much more visible and had spread to his fins. In fact, one was now stuck to his side. I actually started crying; I had a gut feeling we would not be seeing the same Chewbie in the morning. Actually, looking at him like this – not at all the teeny spunky inch-long goldfish we brought home over a year ago, I hoped that it would happen soon. I wondered if we were supposed to explain this to Nolan when the time came or simply “replace” him. I didn’t want to replace him. He was a year and two months old almost to the day. He brought our family a lot of laughs and was my son’s first love. Maybe it was changing the tank, or adding new fish, or just making it so it wasn’t our little Chewbie alone anymore but something had gone wrong. I’d felt it from the beginning. LOVED this post, I can so relate. They become part of the family without you realizing, that’s happened to me many times! Awww this brought a tear to my eye! I so wanted Chewbie to be ok! I hope you managed to explain it to Nolan in a way he’ll understand – it’s sad, but actually it’s probably a very ‘good’ and ‘safe’ way for Nolan to learn about death and dying… if that makes sense…. i’m not sure I explained it that well but I hope you know what I mean.